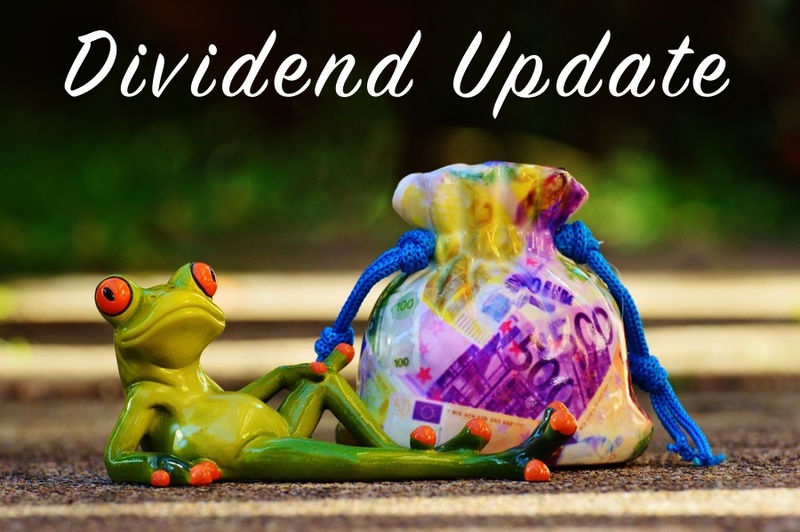 So, I have finally got to a point where I can create a second post on a recurring topic – my second quarterly dividend update (and passive income in general). I must say it is a nice change from thinking about the best way to structure a topic, or from having to crystallise my point of view on a topic. You would be surprised how many times I go to start a post only to realise that there is more thinking required on the topic before I am comfortable with my viewpoint. This time however, it is all facts and figures. Bring on the stats baby! They pay quarterly, and I realised my excel document is not setup to handle quarterly dividends, only quarterly interest – oops. It’s an easy fix but that brings me on to reason #2. I am reporting on the money when it arrives in my bank account rather than when they announce it. This is also true for bank interest and term deposits, but not for share dividends. 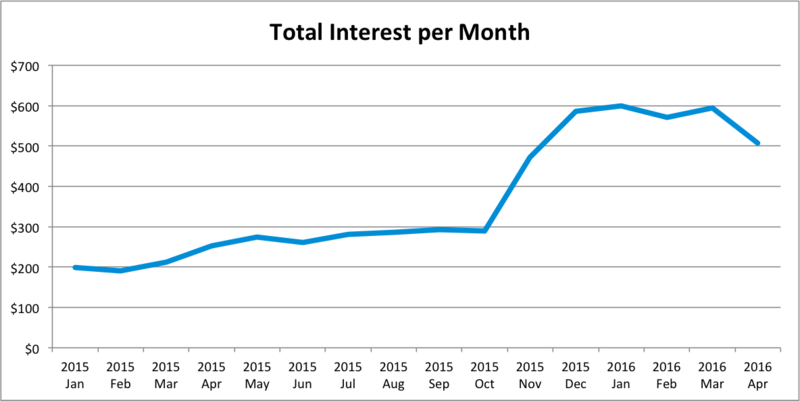 So it seemed a better fit to place it into the Interest graph. Finally, they call the money they pay me “interest” rather than a dividend – this was the nail in the coffin. These updates will cover passive income obtained via the investments listed below from my after tax (non-superannuation) investments. Unfortunately there has not been any moment in this one. 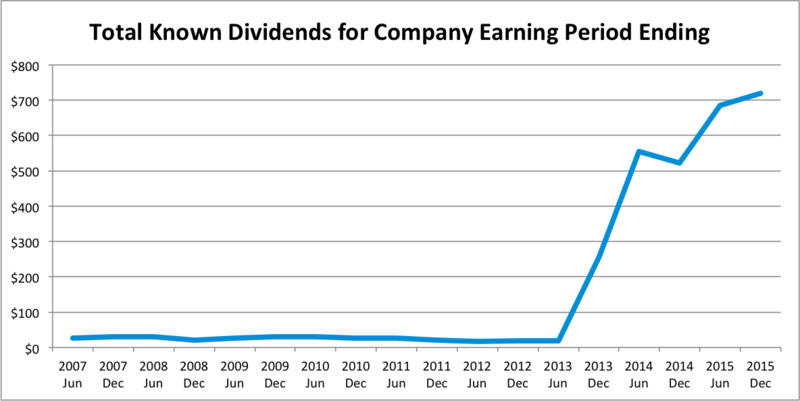 No new dividends were announced for the six months ending December 2015. I am expecting some more but companies like Westpac are just a little slow. Still, I do expect some movement by August, hopefully with both December 2015 and potentially June 2016 announcements (if any of the companies are quick enough in their reporting). It is nice to start seeing a downward trend in the most recent month. Not because I am getting less interest (boo), but because I am buying more income producing assets (yay). The current dip consists of a few companies and my first foray into bonds (outside of super that is). So hopefully that short-term dip will be offset by a larger increase in the next few months. I believe June is the next pay date for the bonds, so come my Q3 update we will see exactly what impact they have had on that blue line. Of course the rental hunting is still on, and should any notable progress be made on that the blue line will plummet after the deposit is paid. I will then work on how best to track rental income when also having to pay expenses incurred when generating that income. It’s like I am becoming an accountant! I am wondering if I should start graphing those numbers too. Can you tell I like graphs? Nothing is better than well visualised data. Thanks for the 2nd update. You sound like me, wanting to research everything first and loving graphs 🙂 Looking good. Since you have bought more bonds now is there an allocation you are targeting? What is the yield on your portfolio? I’ve got WBC too and have been a bit disappointed lately but holding on. Any ideas on where you might invest in property? Yes – researching everything is something that I have to control. I can find myself researching for days to find the best (or best value for money) item even when it will only cost a very small amount. I am also a very visual person. As for allocation, I will do a post on that in the not too distant future. I have a target asset allocation in mind and (pending investment property) am getting closer to being in line with it at the moment. For the property I am torn between a higher rental return of an apartment, and the potential larger capital gains of a house (and more specifically the land that comes with it). Leaning to house at the moment. As for where, I am probably going to stick to the Warren Buffett approach of buy what you know (or in this case where), although it will be in a different suburb to my house – I want at least some semblance of diversification! Look forward to that post. Yep understand it is the land that appreciates, not the building. We rented out our house before we moved in and my only tip would be to look for a place with a low maintenance garden, as tenants don’t look after it and it cost us a lot of money and time to fix it. Or pay for at least quarterly garden maintenance for weeding and pruning etc (tenants should do the lawns anyway). Strata on our unit is about 10% of the rent so that builds the case for house too. Good luck with the hunting! Before I type what I’m about to say, I wouldn’t describe myself as a bear, mostly an optimistic realist. Be careful with buying property (particularly apartments) at this time. I don’t know what city you’re from, but nearly all our cities aren’t looking great on the supply / demand sector. Over the next couple of years there are a lot of apartments that will be coming on the market, but not enough demand for them all. Of course it may not occur, or as badly as a worse case scenario. But keep it in mind when researching. Both Barefoot and RogerMontgomery have referenced this issue in recent times. … … you are yet another person saying the same thing. We are defiantly keeping our eyes open. We have changed the goal from “in 2016” to “investigate in 2016 and buy when appropriate”. Thanks for the details commend however. I have read it a few times now, and has caused multiple conversations (along with other input too). We are aiming to positively gear any property we buy. At worst very small negative gearing for a few years. The main thing I want is for the renters to pay my mortgage. If I have to top it up a little initially that’s ok, but if I get a little left over then WIN! Time frame I am looking is 10 to 20 years of ownership, so other than possibly changing the “when to buy” a few years of “average” performance is not the end of the world. Although, like I said I am now reconsidering timing. Nice stuff there! Although it’s trending up it’s quite consistent :), which is more encouraging. Looking forward to continuing to follow & watch you increase your dividends! End game… interesting thought. I think the end game is generically described as “financial Independence” – specifically covering all bills with passive income. I used to call this retirement, but my partner didn’t like the idea of me sitting on the couch all day. I have to explain that when I said retirement I was talking about being free to do other things (like start a business, volunteer more etc). Some thoughts. One thing I would like to do is build a product of some sort. Both to have an income stream that separated time input to income output, and also to have something that I am proud of. Most of my day-job doesn’t have any “things” that are produced, or not in the same way. As a guy who spends most of his day in Excel, I don’t think you can ever have too many graphs haha. Solid quarter! Nice to see you moving a bit more out of bonds towards equities to move the overall cash flow up a bit!